with the video unit mounted or show analog camera images on a GP unit. On manufacturing floors where visualization has been promoted further, utilizing camera images has become increasingly important. 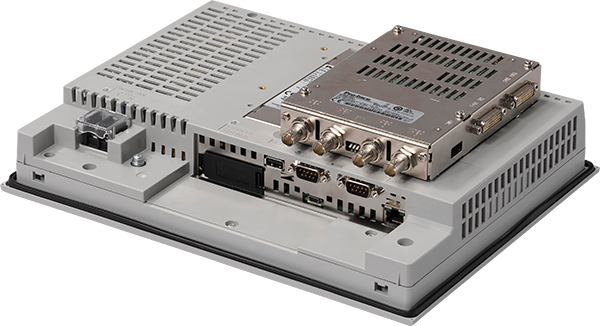 To meet the needs, we have expanded GP4000 Series so that you can add a video unit on GP4000 Series. Camera images can be now shown on GP4000 Series. Customers who have used GP3000 Series M class or GP3000 Series with a video unit attached can take this opportunity to replace it with GP-4621T/GP-4521T and utilize an HMI unit compatible with a video unit for expansion making the most of the latest standard features the HMI unit has. * Not with video image display. For details of replacing GP3000, refer to the replacement guidebook.